If you haven't been keeping up with our latest improvements for business owners, you may also want to check out the new mobile coupons feature in Local Business Center as well. We hope you find these features useful in reaching out to your customers and providing them with even more relevant and timely information about your business. If you're a local business owner, we've just added two new features that can help you reach existing and potential customers even more effectively on your business' Place Page. Both of these features are available by claiming your business through Google Local Business Center. Holding a special event today? Want to post a coupon for 5-7pm tonight? Have a new product in stock? 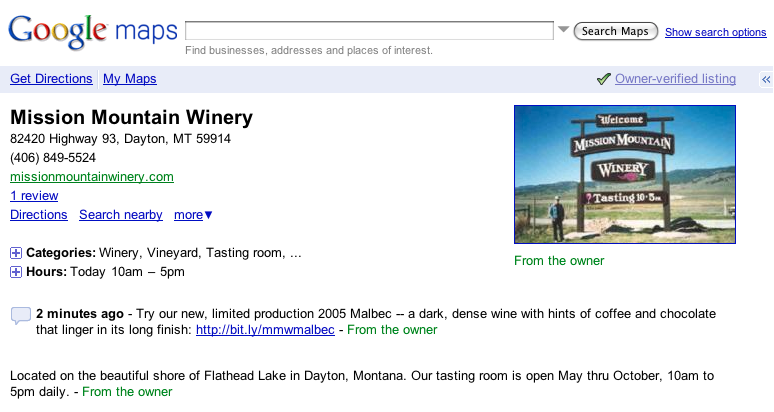 You can now get the word out by posting to your Place Page directly from your Local Business Center dashboard. Once you've logged in and are on your business' dashboard, post an update and it will go live on your Place Page in just a few minutes. 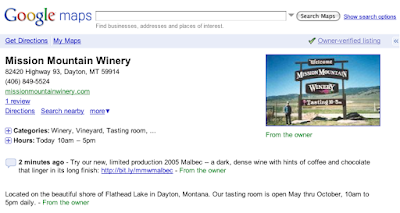 To see an example, check out the Place Page for Mission Mountain Winery which posted to introduce a new wine. We are also introducing a badge for listings that have been claimed in the Local Business Center. This helps our users identify listings that have been updated and improved by their business owners, helping them to trust that the information about your business is as accurate as possible. We are also making it even easier to claim your listing directly from the Place Page by following the "Business owner?" link. We're excited about how Place Pages can help business owners connect with the large number of new and existing customers who visit these pages each day. These users come to Place Pages to easily find basic information, photos, and reviews about your business, as well as a map, Street View photos, and nearby transit information to help them get to your doorstep.